A hedge that is green all year is the perfect backdrop to any garden – heck, many gardens are simply a hedge, lawn and shade tree, and they provide everything needed to enjoy a simple garden. So planting a row of evergreens to create a clipped hedge, or a less formal, unclipped screen, is often the first major project in a new garden, followed by that lawn and shade tree. Of course, for a more beautiful garden flowering shrubs and other plants are needed too, but without that hedge, many gardens don’t look right. This is especially true if you have an unsightly view, or you are overlooked by a road or near-by houses, and the privacy you achieve from a hedge makes such a difference that most people choose to make it an early priority. If you are new to gardening – perhaps this is your first home, after living in apartments – then there are plenty of pitfalls, so getting a clearer understanding of what you need, and what is involved, is the first step to take. Let’s do that here, and see what the vital questions are that will guide you through the process. How high do I need my hedge to be? What plants are the best choice for my area? Let’s take each of these questions in turn and give some answers. This is an important question, because you want the plant you choose to do the job, but equally, you don’t want to plant something too big, that is likely to take over in a few years, or throw so much shade your garden suffers. It is often not obvious how tall a hedge or screen needs to be, unless you are planting right up against a fence or wall you want to hide. Then you can simply measure the height of the wall or fence, and you know the height of the hedge you need. But when it comes to concealing the view of something further away, it gets more complex. There is a simple way to do it though, and here it is. Collect together an assistant, some bamboo canes or tall poles, some string, and a piece of red cloth. Tie the red cloth to the end of one of the canes, and have your assistant hold it on the line where you want to plant your hedge. Stand in the places you want to be shielded from view in and look at that red cloth. Is it high enough? Thought not. Now tie a second cane to the bottom of the first one and try again. Tall enough now? Too tall? Keep adding canes, holding them vertically upright, and checking what it hides, until you are satisfied with the result. Take a measure and see what the height of those sticks are. I bet it isn’t at all what you expected. 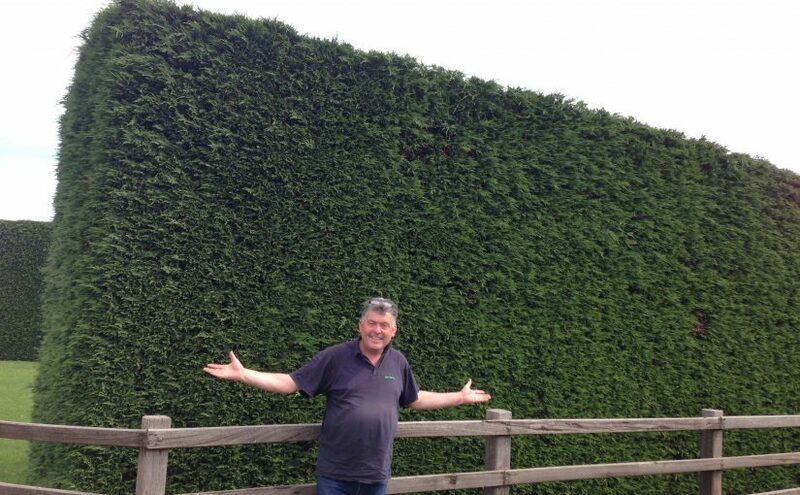 Now you know the minimum height you need for your hedge or screen. That was simple, wasn’t it! Knowing the height, you can now choose a suitable plant. For a screen you want something that will reach that height in under 10 years, although if you need a lot of height that could be unrealistic. So something that will grow fast is needed if the height is over 10 feet. Look at the maximum height listed for plants you are interested in and make sure it will even grow to the height you want. Since most plants slow down as they approach mature height, for coverage in a reasonable time you need to choose something with a mature height twice the minimum height you need for screening – or you will be waiting 30 years for your screen. You might need to have the screen topped every couple of years, if excess height is a problem. Check your postcode against the USDA zone system, and see where you fall. If you are between Zone 5 to 9, then Thuja Green Giant is probably your best bet. It’s fast-growing, and tough as they come. In colder areas Emerald Green Arborvitae, which is equivalent to a cold-hardy, smaller form of Thuja Green Giant, is the top choice. It does grow more slowly (although still fast) and only reaches 12 feet in height, but that is plenty for a hedge or shorter screen, and most importantly it will live happily even in Zone 3 For a taller barrier, consider using spruce. Both blue spruce and Norway spruce are hardy to zones 2 or 3, and if you use a columnar form you will get height to 25 or 30 feet in time, without a lot of spread taking over your garden. For hot and dry areas in zones 7 or more, the Italian Cypress is the top choice – it’s incredibly heat and drought resistant. The most awkward weather conditions are dry and cold too, but there Spartan Juniper of Blue Spruce are the top two choices for hedges and screens. This is easy. Measure the space you want to fill. The basic rule for hedges is one-quarter of the mature width, so it depends on that. Don’t just guess, check it out. Thuja Green Giant, for example, has a mature width of 12 feet, so 3 feet apart is the minimum spacing for a hedge – you can add another foot if you are a little more patient. For a screen you can increase this to half the minimum width, so that is 6 feet for Thuja Green Giant, or up to 8 feet if you aren’t in a big hurry. You can read more details on spacing in this recent blog, ‘Proper Spacing is the Key to Successful Hedges and Screens’. This is the most common question, but also the hardest to answer. Thuja Green Giant will add 3 feet a year when young, dropping to about half that after 5 or 6 years. Other evergreens are slower, with 2 feet a year when young being a realistic expectation. Thorough soil preparation, correct planting, watering as needed, and a good fertilizer program will all help you to maximize growth, not just in height, but in thickness and density, which are just as important when it comes to screening and hedges. Light trimming will also help to build a thicker, denser hedge more quickly, so don’t wait until it reaches full size before getting out the trimmers. If you sort out these questions first, you will be able to make better choices, and have more success with your new screen or hedge. Before you know it you will have that coveted privacy you are looking for. Previous Previous post: Thuja Green Giant – How Fast Does It Really Grow?